Nothing says Sunday brunch like Eggs Florentine, or Eggs Benedict if you want to add some meat. It is something a bit special for breakfast, that you wouldn’t have every day, but if you make a hollandaise sauce the typical way, it can carry a lot of calories. It is usually made with quite a lot of butter, but my recipe doesn’t include any. I have come up with a healthier hollandaise sauce that uses yoghurt instead of cream. You probably guessed that I would use yoghurt, you know how much I like to use it as a replacement to cream and butter. You have to cook the sauce very, very gently and low though, as if you quick it too quick at a high heat, the yoghurt can split. 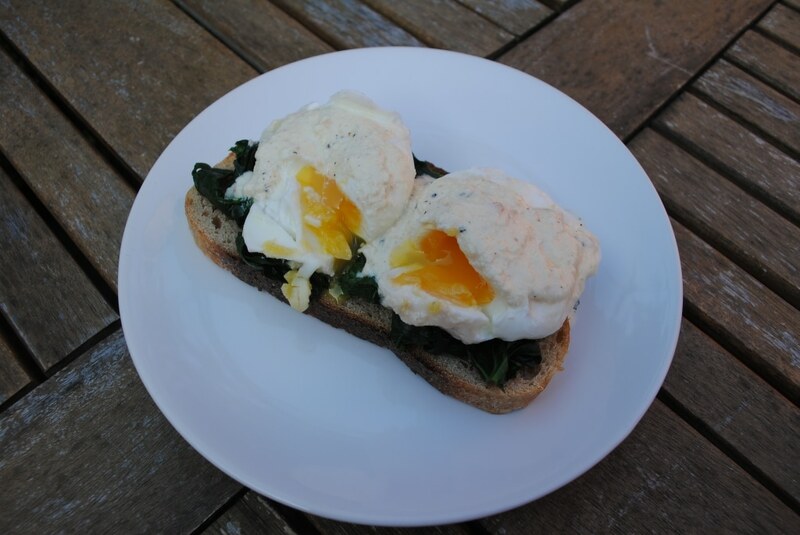 Eggs Florentine is a classic breakfast or brunch dish. This healthier version is not only delicious, but it's on the table in less than 10 minutes. Cook the spinach in some boiling water for a couple of minutes. Halve the English muffins and toast them. Poach the eggs (Bring some water and 1 tbsp of vinegar (this helps to keep the whites together) to the boil in a pan and gently crack in the eggs. Simmer for 4 minutes for a runny yolk). Put the yoghurt, mustard powder, lemon juice, cayenne and salt and pepper in a small pan and heat for 4 minutes, whisking constantly. Heat on low and don't overheat as the yoghurt will split. 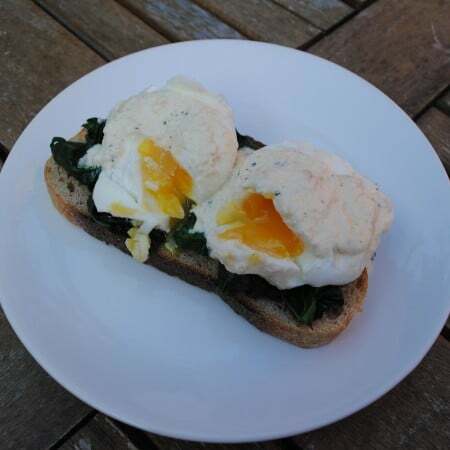 Put the drained spinach on the English muffins, top with an egg on each one and pour over some hollandaise sauce. Spinach for breakfast is awesome. It is good to start the day with a healthy boost like that. Yes, it makes me feel really good in the morning. This looks really nice. Can’t wait to try it. The sauce sounds really tasty. This makes me sad that I have already eaten breakfast. I might just have to make this tomorrow, it will make Monday so much better. Thanks girl! This looks really nice too. We like to have something a bit different for breakfast on the weekends. Delicious. I usually start my morning with spinach in a green smoothie, so this will be a different want to get that iron in. I am in awe of how you can make so many things much much healthier. I can’t wait to make this. I love eggs florentine. There is this amazing little cafe near use that serves this, but the sauce is full of calories, so I can’t have it very often. I am going to make this very soon, so I don’t have to feel like I am missing out. Thanks Danni. Your recipes are the BEST!